Our Journey started with two slightly nervous Mums, three very excited 5 year olds and an SUV packed with absolutely everything we could possibly need, but most importantly, one red backpack. This red backpack contained all the very important things like my phone charger, the camera charger, the satellite phone that my very protective parents lent to me (oh, by the way, I’m 39 years old), sparklers, the kids’ Polaroid cameras and all of our warm clothes. 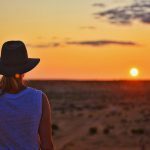 But let’s go back for a second, if you don’t know the bigger picture of why we’re doing this or where we’re headed, read our first article: The Ultimate Outback Queensland Road Trip – with Kids. If you’re going on a road trip with children the first thing you’ll probably contemplate is whether it’s about the journey or the destination. 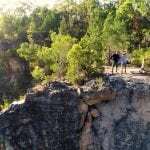 The main purpose of our trip was to visit the Australian Dinosaur Trail, so we originally considered flying into Longreach and starting our week long holiday there. In the end we extended the holiday to two weeks and did it by car. I’m really glad we did! 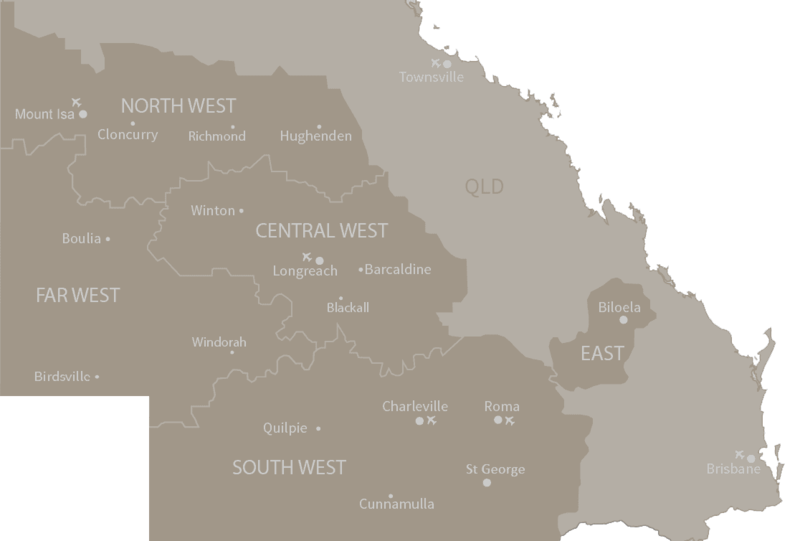 If you’re driving in Outback Queensland, you’ll be somewhat forced into making your trip about the journey. The kangaroos start playing “Frogger” with the tourists from dusk to dawn, so you’ll need to restrict your driving to daylight hours. But this is a great thing, you’ll see a lot more and the kids will only be spending about 4 hours each day in the car (which happens to synch. up with the approximate battery life of an iPad… thanks Apple). Check out our video for an overview of these places, then read about them below. We were tempted to drive from Brisbane through to Mitchell, but decided to break the journey up and stop in at Chinchilla after a 4 hour drive. It was just a little stop over for us, this was the place that we discovered that our most important piece of luggage… “the red backpack” was left at home. So we went shopping. Compared to Brisbane it was quite limited, however… thanks to their country hospitality I managed to find a lovely shop that sold me the demo model of my camera battery charger (she actually brought me to tears with the effort she put in to help me out), and Target Country provided us with one piece of warm clothing each. Don’t be fooled by the warm weather, temperatures can drop at night. Make sure you call into the Purple Bean Cafe for a fantastic breakfast or lunch, the food was lovely. After a 3.5 hour drive to Mitchell we discovered our first little piece of heaven, The Great Artesian Spa. I encourage you to… no, I forbid you from going any further without emerging yourself in the naturally heated waters from the Great Artesian Basin. Given this is all about travelling with kids I’ll make it clear for you. One pool is a beautiful (and natural) warm temperature and will make you want to melt and float forever, the other is cold, so take it or leave it. See, if you stop in here, you won’t have to bath the kids tonight. Grab an iceblock at the cafe, then jump in the car and go off road to Bonus Downs Farm Stay, about 30 minutes off the highway, where your adventure will begin! I really can’t rave enough about this place, I left with Madonna and Lyle (the owners/hosts) embedded in my memory forever. It wasn’t just the fact that they played with my kids as though they were their blood Grandparents. It wasn’t the fact that they served “chicken pasta” for dinner and somehow convinced my fussy eaters to devour it. It wasn’t the fact that they kept the red wine flowing (and I resent them a little for my slight headache the next day)… I think it was just the hospitality and warmth, and to be honest, I couldn’t get a connection on my phone and Madonna called my Mother for me, to let her know I was safe. Whether you’re a family, a group of backpackers OR a school who is looking for a fantastic experience for a big group of kids, Bonus Downs Farmstay can accommodate all kinds of groups with different accommodation options. If you’re looking for accommodation, stay in the Shearing Shed (I think you’d fit a whole classroom of kids in there)! … and go on a tour up the road to let the kids experience their first campfire and (mouth watering) damper. Madonna and Lyle, we’ll be back, I promise. After leaving Mitchell, we stopped into Tambo on the way to Blackall, just to visit the famous Tambo Teddies. Their story is amazing and they’ll take the time to share it with you. Each bear is created from 100% Australian woollen sheepskin and you can see them making them in the shop. When my little man decided that he wanted to purchase the lovely “Bickie Bear”, the engaged with him and asked whether he needed anything else. “I’m not sure if he can see very well, maybe could you remove some fur around his eyes please? It important for him to see”. Okay then. Hand on heart, it’s the softest, most loved bear he owns. 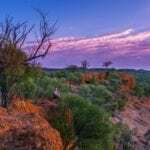 Just a one hour drive from Tambo, you’ll find Blackall. Whilst we didn’t have the time to explore everything there is to see and do (which according to my big brother, is significant – he claims it’s one of his favourite places in Outback Queensland), I can verify that Blackall Caravan Park is the place to stay, they have all kinds of accommodation, but most importantly – DON’T go looking for dinner, just eat there. We were trying to figure out where to eat then decided to head to reception, stumbled upon a menu, became lazy and just ordered. The food is actually fantastic, and the outdoor camp kitchen area is beautiful (complete with a little “toilet surprise” that scared the life out of me… since I’m being honest). 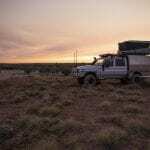 Well, Longreach is for another time, there’s just so much to do that it deserves its own article! So far, we’ve just talked about our trip to Longreach, next… so many adventures. In summary, make it about the journey and the destination, you won’t regret it. Great insight into what to expect. I’m planning on doing this trip later this year so researching routes and ‘what to do, where’ and this article is great. Thank you very much. Stopped in Charleville in the way for two days at a cute Airbnb and are currently in Augathella for a stop,great pub! In to Tambo,Blackall and Longreach for a few days. From there we are in the hunt for Dinosaurs!!! (reason we came). Hi we planning to do this on motorcycles in april may 2019 this is a real good veiw on what we can look forward to we will be leaving from Browns Plains Brisbane . Thank you. wow, find your good recommendation inside the outback around Hervey Bay. Thanks for your great information that couldn’t found from internet at all. Great share.